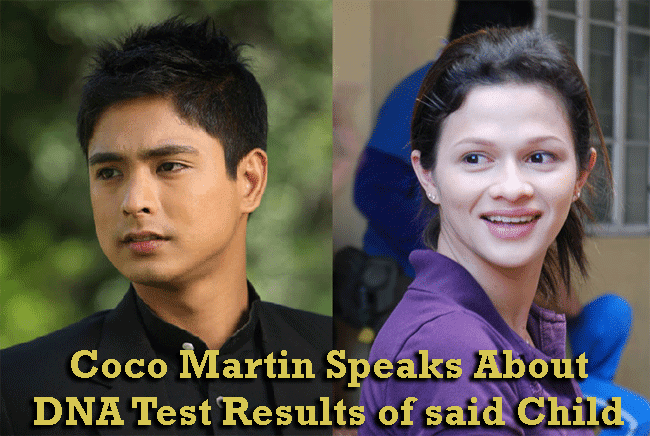 Finally, after being silent for so many years, Coco Martin breaks it and shared his sentiments over Katherine Luna’s claim that he is the father of Martin’s son. Going back to the humble beginnings of Coco Martin, before he became famous in movies and television shows and hailed as “Prince of Drama,” Coco was a restaurant waiter. He grabbed every opportunities that came his way and he became famous in indie films. A certain movie called “Masahista” became the way for Katherine Luna and Coco Martin to know each other. The movie was released in 2005 and it was a film by Brillante Mendoza. Though the two was paired in the movie and Coco also admitted that something happened between Katherine and him, he also stressed the fact that they did not stay together for a longer time and that there was no relationship that existed between them. The result of the DNA testing was negative for Coco but he is willing to have the child under his custody. There was an incident when Coco was shooting “Born to Love You” in Luneta and the child and his grandmother was there. Coco talked to him and said that he wanted to give the best for his child. He talked to the grandmother and asked her to put the child under his custody so that he could give him proper guidance and he could also provide his needs. The grandmother said that it is not that easy. Coco has to undergo legal process and DNA testing as well. The result of DNA testing is not a total relief for Martin cause it brings back memories of the past.